AT FORT LEAVENWORTH—THE TREATY OF MEDICINE LODGE—GOING TO FORT DODGE—DISCONTENTED INDIANS—INDIAN OUTRAGES—A DELEGATION OF CHIEFS—TERRIBLE INDIAN RAID—DEATH OF COMSTOCK—VAST HERDS OF BUFFALO—PREPARING FOR A WINTER CAMPAIGN—MEETING "BUFFALO BILL"—HE UNDERTAKES A DANGEROUS TASK—FORSYTH'S GALLANT FIGHT—RESCUED. The headquarters of the military department to which I was assigned when relieved from duty at New Orleans was at Fort Leavenworth, Kansas, and on the 5th of September I started for that post. In due time I reached St. Louis, and stopped there a day to accept an ovation tendered in approval of the course I had pursued in the Fifth Military District—a public demonstration apparently of the most sincere and hearty character. From St. Louis to Leavenworth took but one night, and the next day I technically complied with my orders far enough to permit General Hancock to leave the department, so that he might go immediately to New Orleans if he so desired, but on account of the yellow fever epidemic then prevailing, he did not reach the city till late in November. 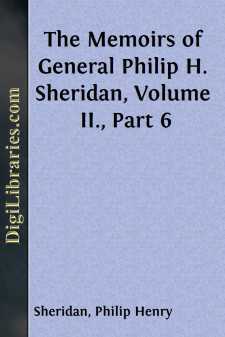 My new command was one of the four military departments that composed the geographical division then commanded by Lieutenant-General Sherman. This division had been formed in 1866, with a view to controlling the Indians west of the Missouri River, they having become very restless and troublesome because of the building of the Pacific railroads through their hunting-grounds, and the encroachments of pioneers, who began settling in middle and western Kansas and eastern Colorado immediately after the war. My department embraced the States of Missouri and Kansas, the Indian Territory, and New Mexico. Part of this section of country—western Kansas particularly—had been frequently disturbed and harassed during two or three years past, the savages every now and then massacring an isolated family, boldly attacking the surveying and construction parties of the Kansas-Pacific railroad, sweeping down on emigrant trains, plundering and burning stage-stations and the like along the Smoky Hill route to Denver and the Arkansas route to New Mexico. However, when I relieved Hancock, the department was comparatively quiet. Though some military operations had been conducted against the hostile tribes in the early part of the previous summer, all active work was now suspended in the attempt to conclude a permanent peace with the Cheyennes, Arapahoes, Kiowas, and Comanches, in compliance with the act of Congress creating what was known as the Indian Peace Commission of 1867. Under these circumstances there was little necessity for my remaining at Leavenworth, and as I was much run down in health from the Louisiana climate, in which I had been obliged to live continuously for three summers (one of which brought epidemic cholera, and another a scourge of yellow fever), I took a leave of absence for a few months, leaving Colonel A. J. Smith, of the Seventh Cavalry, temporarily in charge of my command.